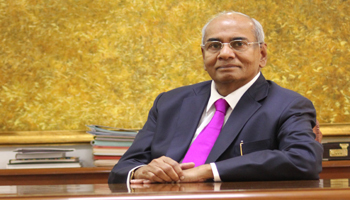 Financial year 2018 – 19 was a good one for IFFCO. We were able to register a profit in excess of `1000 Crore and were able to achieve our goals in desired time and costs. All our plants produced to the best of their capabilities and we managed to produce a total of 81.50 Lakh Metric Tonnes of fertiliser (45.62 Lakh Metric Tonnes of Urea and 35.88 Lakh Metric Tonnes of Complex fertilisers) in FY 2018-19. With constant upgradation in technology we were able to rationalize our production costs and did all this with minimum environmental footprint and with the lowest ever energy consumption of 5.33 GCal/MT. This was made possible largely due to the efforts of our production team which never stops to innovate and as a result stays ahead of the curve and are constantly awarded by the International Fertiliser Association, the Fertiliser Association of India and by several national and international organizations for their efforts. In FY 2018-19 the marketing team did a commendable job and was able to sell in excess of 115 Lakh Metric Tonnes of fertilisers and recorded highest ever sale of 32000 MT of speciality fetilisers, a decent number considering the prevailing economic and environmental conditions. I must mention that the marketing team did their best in ensuring timely availability of fertilisers to farmers across India despite the challenges. They have also done a phenomenal job in making our innovative products like Sagarika, Bio-fertilisers and water-soluble fertilisers a hit amongst the Indian farming community. It is largely due to their efforts that these products are doing extremely well in the market and in the long run would result in considerable savings for the farmer while being gentle on the environment. I am happy to share that we will continue to focus on developing such innovative, environment-friendly nutrition solutions for the Indian farmer in the forthcoming years as well. Our research and development labs are working day and night in developing fertilisers that would not only be affordable but would work as per the needs to the soil so that the farmer gets the best in crop science in the best possible cost. The latest in this series being the innovative ‘Nano fertilisers’, a one-of-a-kind, ‘smart’ fertiliser that would deliver nutrients as per the need of the plants. I am happy to share that have commenced trials of these Nano-fertilisers and would soon launch this across the country. Besides this our IT, HR, Finance, Commercial and various other departments and teams across locations also did their best. It was largely due to the teamwork and coordination amongst these departments and teams that made FY 2018-19 a successful one for IFFCO. I hope that this would continue in FY 2019-20 as well. On this note, I would like to wish all of you the very best for the new financial year (2019-20) and would also like to thank our Chairman Sh. B.S Nakai, our Vice- Chairman Sh. V. H. Radadia and all the Directors on the board of IFFCO for their continual support and direction. I would also thank all the employees of IFFCO, IFFCO Employees Union and IFFCO Officers Association for their continuous support. I am equally thankful to all our Joint Venture partners, Department of Fertilizers, Ministry of Agriculture and Farmers Welfare along with the Indian and International Media for their valuable support and assistance from time to time.